While many enjoy the excitement of purchasing a brand-new home and having a blank slate to work with, others prefer to not have to worry about decoration, they just want everything ready as soon as they walk through the door. With the ultra-demanding schedule of most affluent clientele, it is completely understandable why having to deal with decoration is a hassle instead of an enjoyable activity. This breathtaking Hualalai home is offered turnkey to allow you to immediately enjoy the benefits of your home and lifestyle in absolute luxury. 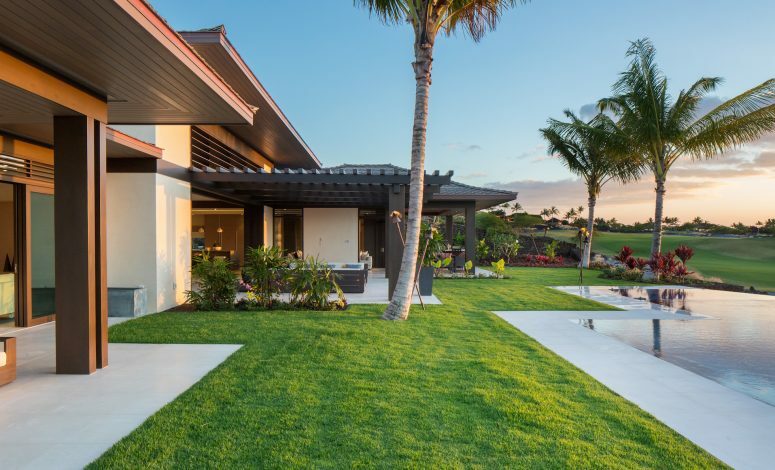 Step inside this brand new contemporary Hualalai residence and you’ll quickly realize the immaculate attention to detail applied not just to the unique architecture but also to the interior design. Designed by Vancouver based OpenSpace Architecture who specialize in one-of-a-kind residential projects, this 6,402 sq. ft. 5 bed and 5.5 bath residence exudes an opulent modern day feel with its 24 ft. ceilings and extensive integrated glass. Everything is brand new from the custom designed contemporary furnishings to your very own climate controlled wine room able to equip 700+ bottles with Fond du Lac limestone wall. The moment you step into this home, you are stepping into your exclusive slice of Big Island paradise with an infinity-edge salt water pool and in water lounge area to decompress after a day of adventure. The open-space floor plan seamlessly embraces nature and elegant architecture. Designed with both family an guests in mind, each of the 5 bedrooms is complete with gorgeous Bathworks fixtures and private, beautifully landscaped walk-out shower gardens that will make you feel truly connected to your beautiful surroundings. Hualalai is known for being an oasis to the world’s most affluent individuals. The lifestyle surrounding it is nothing but impressive. There is no shortage of things to do, whether you just want to relax and enjoy the best fine dining on the Big Island or you are looking for an adrenaline pumping adventure such as the Four Seasons Hualalai volcano tour. The volcano tour is available for up to four people to allow utmost privacy and personalization to your experience. Nearby beaches include the Four Seasons beach, Kua Bay and Makalawena. If you’re up to experience one of the best golf courses in the world, just a few steps away you’ll find the renowned Jack Nicklaus 18-hole course. With all the excitement opening up your appetite, you can end the day indulging your taste buds at ULU’ Ocean Grill + Sushi Lounge which showcases an innovative ocean-to-table menu. The restaurant has been named one of the 100 Most Romantic Restaurants and one of the 100 Best Al Fresco Dining Restaurants in America by OpenTable. Hualalai affords you the luxury of ultimate comfort, endless adventures nearby and buyer anonymity in a prime destination. All you have to do is turn the key and begin exploring.